Forget super-skinny card skimmers and clever malware attacks. In Russia, many of the attempts to illegally obtain cash from ATMs are rather more crude—because they involve explosives. 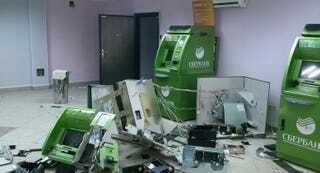 English Russia points out that more than 20 Russian ATMS have been blown up recently in an attempt to steal money. The site reports that criminals pump the cash dispensers with propane, which they then ignite—in the process tearing the machines apart with brute force. The explosions can send debris up to 50 meters from the ATM.